Two rival toy shop owners reluctantly join forces when an unscrupulous toy magnate opens a box store in their town. Two news broadcasters who previously were in love fight for a position as a morning talk show host that they both want, ultimately finding what made them like each other so much in the first place. A talented singer forms a musical group and challenges her rivals to a competition on Christmas Eve. A series of mishaps threaten a recently divorced mom's attempts to make her two kids' first Christmas "without dad" perfect. Santa's stockman has to find a replacement for an injured reindeer. When he locates one, complications and love ensue. To help those looking to purchase this movie, it is also known as "Oh Christmas Tree"
Chloe plans the 1st Christmas fair in town where she meets Evan and falls in love but he has to go to Norway for his dream job. 2nd Xmas fair a year later he brings a cute Swede. 3rd Xmas fair Chloe is dating Ted. How about 4th Xmas fair? Small-time con man Nick DeMarco is ordered by his parole officer to take a minimum-wage job as a department store Santa during the holidays... and he hates it. Near the end of his first shift, he hastily promises a young boy, Billy, that Santa will bring his estranged parents back together by Christmas. When his sister Rosemary hears this, she is livid and can't believe he would break a little boy's heart with an empty promise. After a long night of soul searching - and with the help of an insightful female pastor - Nick decides to make good on his promise to the child, somehow. But after meeting the boy's mother Carol, will Nick ultimately choose to put the happiness of others ahead of his own? 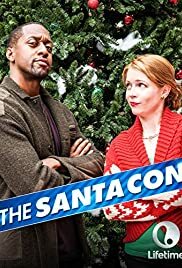 I came across this movie by accident just looking for Christmas movies to watch, and my standards were low just because I've seen sooo many Hallmark/TV Christmas movies that are painfully over-acted with surface level plots, but I seen Jalleel White and Mellissa Joan Hart so I just played it.